You are currently browsing the tag archive for the ‘Artemis Fowl’ tag. From Australian children’s authors let’s skip across the planet to Ireland. If that makes you feel slightly dizzy, try to imagine how I feel! Wexford-born native Eoin Colfer’s Artemis Fowl series was a breath of fresh air when it first arrived. A modern, witty take on Irish mythology and contemporary society….with farting leprechauns, just to make sure kids paid attention. Half-Moon Investigations is a new series from Colfer and I am happy to report, is also a very successful humour book for children. Fletcher Moon is the town joke in the small community of Lock. A twelve year old boy who likes to ‘play at detective’. He even insists on showing off a detective’s badge, which he insists is genuine. His kind parents indulge the fantasy, but hope he’ll grow up and notice girls some day. The other children are not so understanding and have branded Fletcher with the nickname ‘Half-Moon’. He’s a weirdo, a nerdy kid with delusions of grandeur. What most people don’t know is that Fletcher is an accredited private investigator. Sure he used his dad’s birth date and credit card to apply for the two year course. Nevertheless he has a real detective’s badge and know’s the course books off by heart. He dreams of one day working for the FBI as a forensic investigator, like the kind on CSI. In the meantime he’s hoping to score a real case and maybe even a real fee. Mostly the school kids he has helped pay him in chocolate. 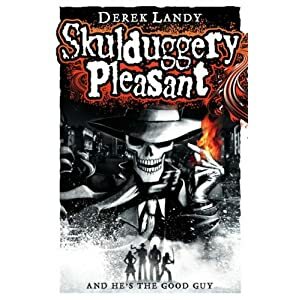 Fletcher soon learns to regret his ambitions when popular ten-year old April Devereux hires him to investigate a series of mysterious robberies. The prime suspect is one Red Sharkey, the heir apparent of Lock’s local criminal gang lord Papa Sharkey. He doesn’t appreciate the attention Fletcher is drawing to him and does not hesitate in letting his feelings on the matter be known. What’s more, the boy detective soon discovers the danger in becoming too involved in a case, after he finds himself first assaulted and then framed for a serious crime. Is April Devereux ten Euro retainer enough to cover his growing legal fees and bail? This is winning, fast-paced stuff, a kiddy version of a Sam Spade mystery. There is even, in the classic detective format, two mysteries that overlap for Fletcher to resolve. In many ways this resembles an Irish take on Rian Johnson’s Brick, starring Joseph Gordon-Levitt, with all the tropes of detective fiction entertainingly inserted into this schoolyard adventure. There’s even a tween stool pigeon and a pink loving femme fatale. On the weekend I happened to catch five minutes of a television series based on Colfer’s novels. Not only was the action relocated to England, but I felt the spirit of the novel was lost, with the usual generic and insipid child actors standing in for the preternaturally worldly-wise heroes and villains of this yarn. A real shame and a missed opportunity I feel for the Irish film and television industry not to have kicked Colfer’s door down for the rights (but then, that is not an unusual error on their part). I would strongly recommend these books for children between the ages of 10 – 15 and adults who enjoy a wry chuckle. I am looking forward to gobbling down the rest of these books like I did the Artemis Fowl series.